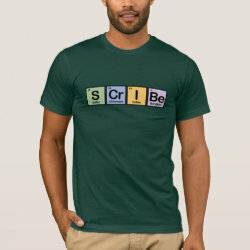 Scribe Toddler Fine Jersey T-Shirt: Your search for the ultimate basic toddler T-shirt is officially over. This soft, cotton tee comes in basic and not-so-basic colors, from red, white and blue to key lime, lavender and raspberry. Dress it down with jeans or up with khakis. No matter how your little guy or gal wears it, it's guaranteed to be in style. Check out other products with this design or view all .